Venice Theatre Presents "Cat On A Hot Tin Roof"
Williams’ emotionally charged drama, Cat on a Hot Tin Roof, is running on Venice Theatre’s MainStage Friday, April 12 through Sunday, April 28. Performances of the 1955 Pulitzer Prize winner are Tuesdays-Saturdays at 7:30pm and Sundays at 2pm. Tickets are $25 for adults, $17 for college students, and $15 for youth up to 12th grade. They are available online at www.venicestage.com or by calling the box office, 140 W. Tampa, at 488•1115. 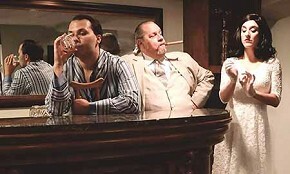 (l-r) Patrick Tancey, Murray Chase and Amanda Heisey star in Cat on a Hot Tin Roof.